Indian and African telecom giant Airtel on Thursday unveiled it’s new logo,a source said Airtel dons the new look In a bid to consolidate its global presence and to promote its offerings in 3G, telecom giant, Airtel has got a new brand identity with a new logo and positioning. Talking about the new brand identity, Sunil Bharti Mittal, chairman and managing director, Bharti Airtel, says, "Fifteen years ago, Bharti Airtel started its journey in India with a promise of delivering world-class and affordable services. 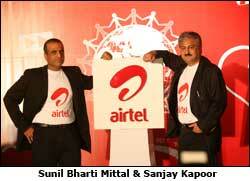 Airtel is in now present in 19 countries - 16 African countries, Sri Lanka, Bangladesh and India." Mittal adds that the brand was so far known as Zain in Africa and Warid in Bangladesh. "Thus, the idea was to give the brand a uniform presence across all these markets. Also, the world is moving towards digitalization. From now, it's also going to be about social media, commerce and 3G. Therefore, keeping the evolution of the telecom business as well as our expansion in mind, we decided to take brand Airtel to the next level." Designed by London-based brand agency, Brand Union, the new logo is the letter 'a' in lowercase, with 'airtel' written in lowercase under the logo. Explaining the new look in detail, Sanjay Kapoor, CEO, Bharti Airtel states that the new identity underlines Airtel's willingness to embrace everything that is new. He adds, "The logo type is modern, vibrant and friendly and signals our resolution to be accessible to our customers and stakeholders. And the lowercase is our recognition for humility. The red colour, which is an integral part of the brand, continues to represent heritage, energy and passion. The new curved and the gentle highlight almost gives the impression of a living object; at the same time, it represents a dynamic force of unparalleled energy, brings us closer to consumers and is a symbol which will help ensure instant recognition across diverse international markets."